The Lone Ranger made his very first ‘public’ appearance way back in 1933 as a radio serial and due to its huge popularity, it was later adapted to both TV and movies. He was a former Texas Ranger who fought outlaws in the Wild West with his native Indian friend Tonto. The original TV series ran from 1949 to 1957 with Clayton Moore starring as the Lone Ranger and Tonto was played by Jay Silverheels, who was a Mohawk from the Six Nations Indian Reserve in Ontario, Canada. His title doesn’t come from the fact that he likes to work or ride alone but because he was the only surviving member of a group of six Rangers who are ambushed by a group of outlaws led by Bartholomew "Butch" Cavendish. Tonto later stumbles upon the massacre and finds one of the Rangers barely alive and nurses him back to health. 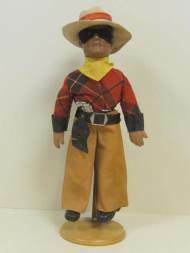 The very first Lone Ranger action figures were released by the Dollcraft Novelty Company of New York City in 1937/38. The listed copyright is T.L.R. Company, Inc. Two dolls/figures were produced as Hi-Yo-Silver dolls, each standing approx. 10 1/2, 15 1/2 or 20" tall, in height, of Tonto and The Lone Ranger. These figures consisted of composition flange heads and lower arms, stuffed cloth body upper arms and legs, stitched hip joints, molded painted hair, painted eyes, closed mouth. 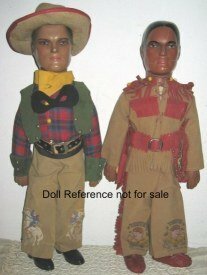 The Lone Ranger and Tonto are dressed in faux buckskin and suede clothing and each has a holster with two guns. It's very rare to find these dolls in mint condition. Due to the fact that they were made out of composition, which is pressed sawdust and glue, therefore they broke and chipped very easily. They also came with a whole host of accessories and it is especially rare to find them complete with everything e.g. the hat with the paper hat band with "Lone Ranger” written on, the original string tag, Tonto's rubber knife, the original cap guns, and his badge as well as the original box. These dolls/figures original price was $3.50. 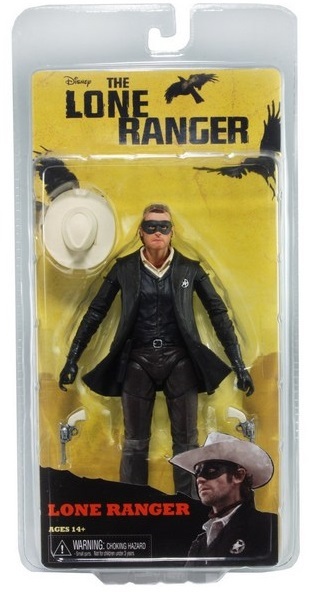 It's very rare to find these dolls in MIB condition and The last Lone Ranger I've heard of selling at auction in the original box brought $1,300.